As the last of the old evenroot is used up, desperate shadir riot in the Veil. Hungry for any way to keep their hold on humanity, they unite under Shanek DanSâr, an unlikely despot whose erratic rule threatens to subjugate even his own allies. As war comes to Er'Rets, treaties are broken and new alliances formed. Trevn leads the battle on the ground while Onika and her warriors hold the line in the Veil in a final stand against darkness that will forever determine the fate of the Kinsman people. 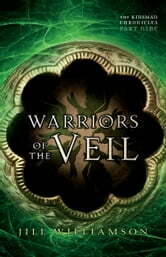 Warriors of the Veil is collected together with parts 7 and 8 in King's War.